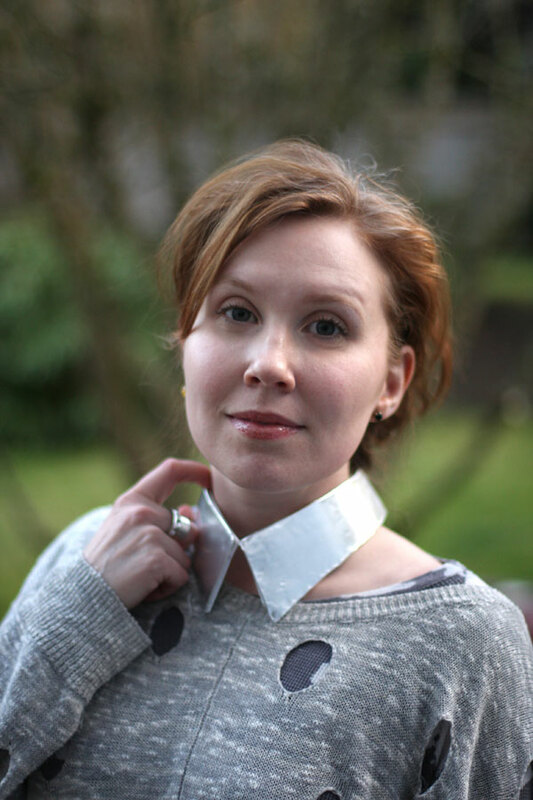 Removable collars have been the must-have-it accessory for the past year now, and I honestly didn’t think there were any more varieties I hadn’t seen. Bejeweled! Neon! Flowered! 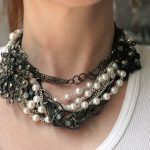 Pearl-encrusted! Leather! 2. 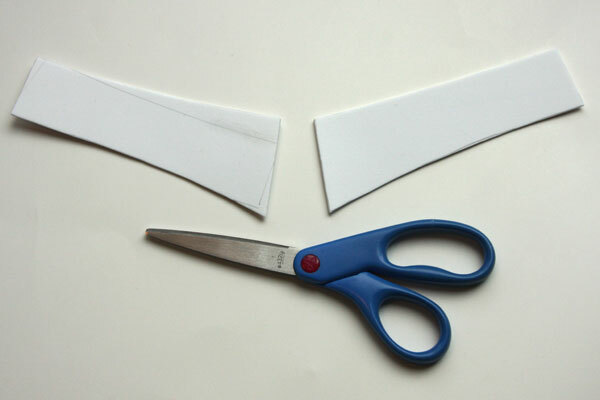 Cut those pieces out. 3. 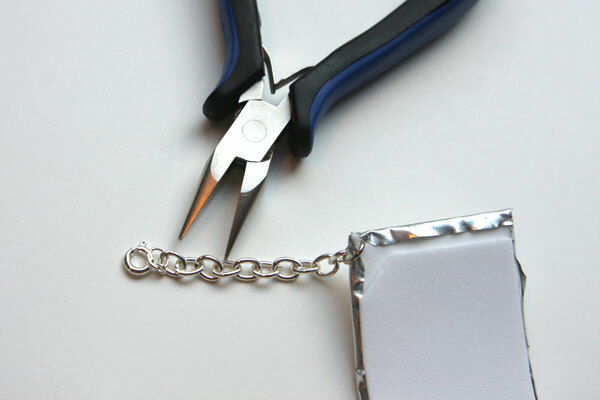 Use the pattern again to trace two pieces onto the embossing metal (again, flipping the pattern over for the second piece). 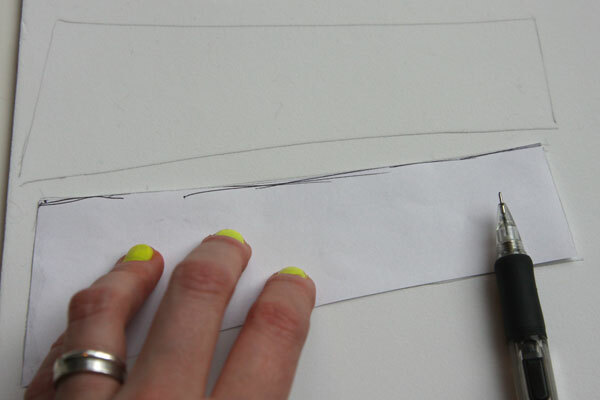 Trace around the pattern about 1/4″, using only the tip of the pencil to make in indented line. 4. 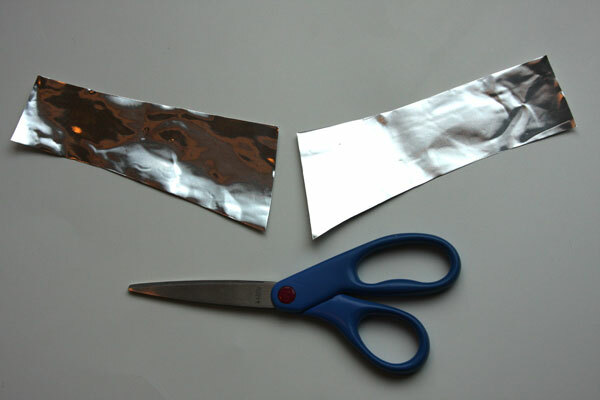 Cut out the pieces out of the metal. 5. 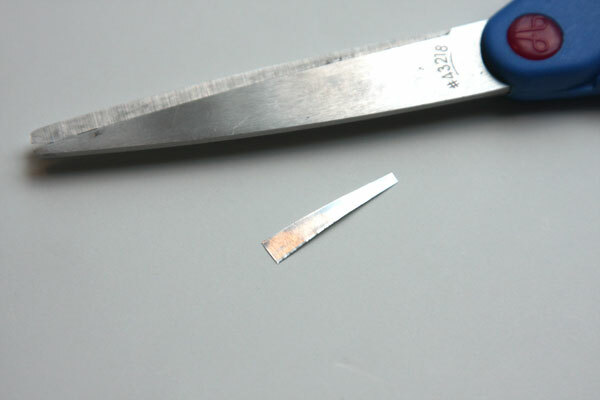 Use your awl or another sharp instrument to poke a hole in each piece at the top back corner, about 1/4″ from the edges. 6. 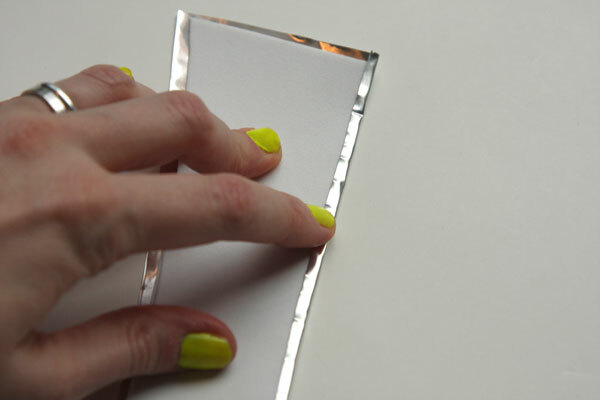 Peel the back off the foam pieces and stick them onto the back sides of the metal pieces. 7. 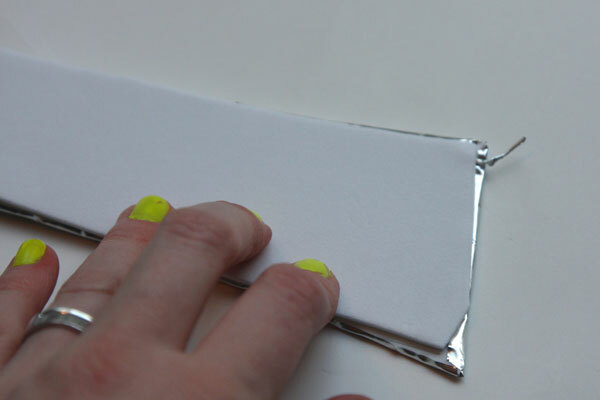 Use your finger to smooth the front of the metal out onto the foam backing. 8. Using the hole you made in the metal as a guide, stab through the foam so the hole goes all the way through at the top back edges of the collar pieces. 9. 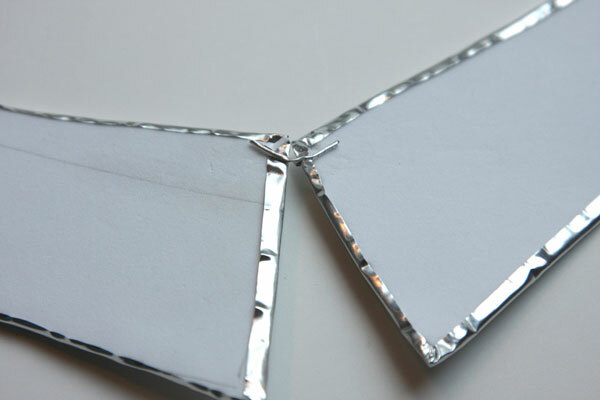 Flip the pieces onto their fronts, and fold the excess metal over onto the back sides. Be careful! 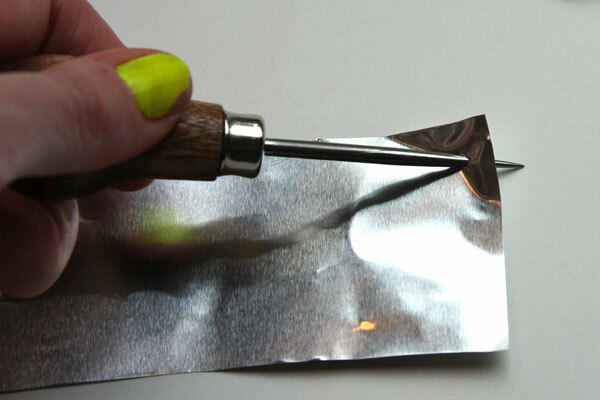 Embossing metal is slightly thicker than foil, and can cut you easily. 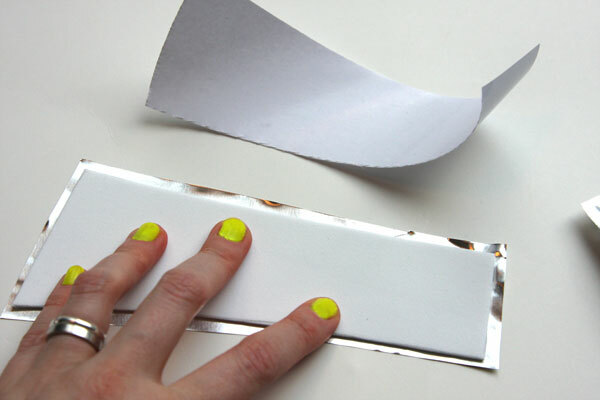 Try to make your folds as crisp as possible. 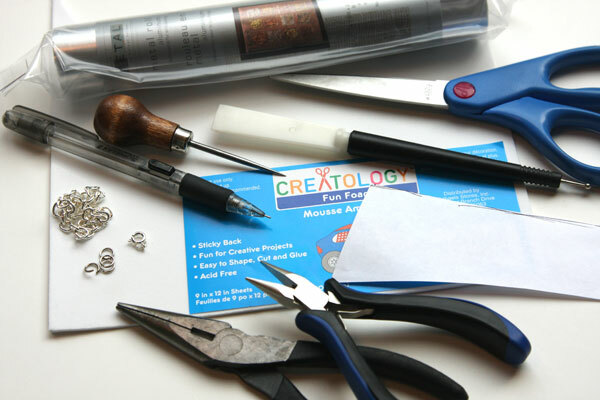 Using your smoothing tool/bone folder/butter knife to press the excess onto the back can also be helpful. 10. 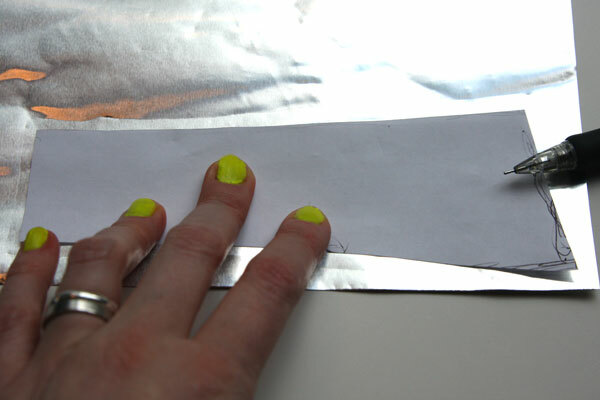 Clip the corners in the above manner to help you make nice, crisp corners. 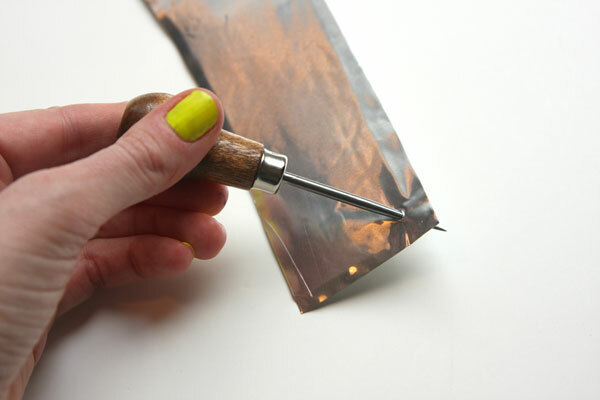 You don’t want them sharp, so after you’ve folded the metal over, rub the corners slightly rounded with your smoothing tool. 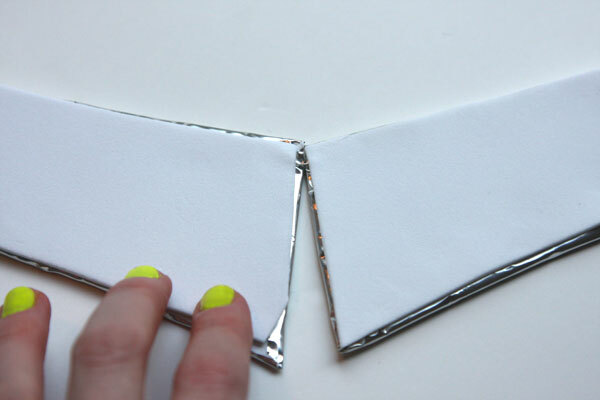 Make sure you cut the metal excess so it doesn’t cover up the holes you made when folded over. I stuck the awl through there to remind me where they were. 11. 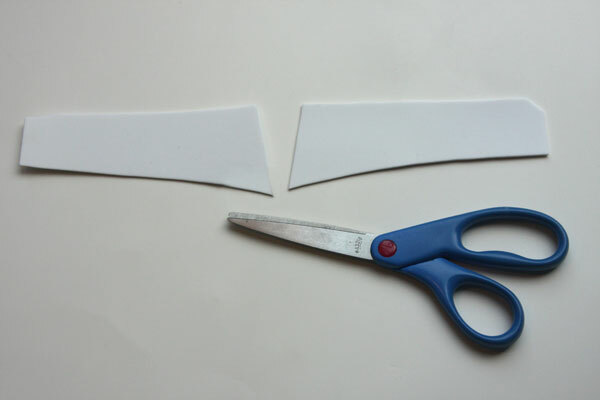 Cut 2 more pieces of foam using the pattern, and this time, trim about 1/8″ off them all the way around. 12. 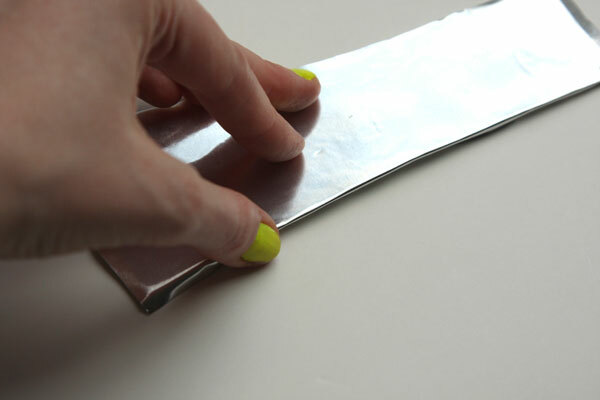 Cut a long rectangle of metal (or use a scrap). 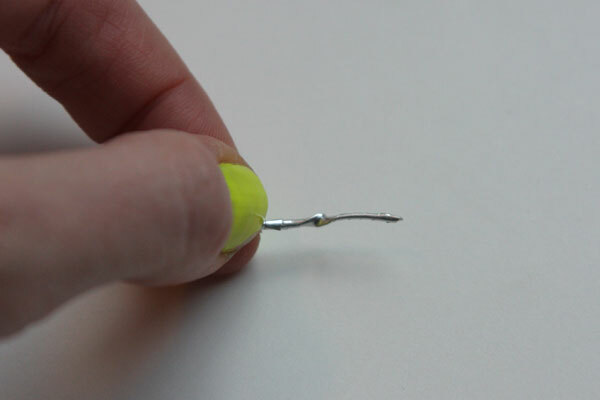 Mine was just over an inch; in retrospect, probably about 3″ would be better. 13. 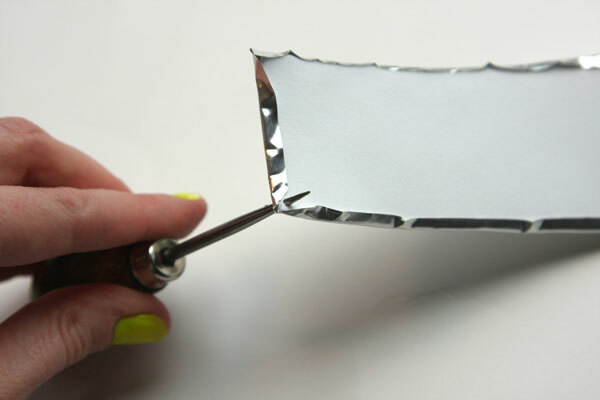 Twist that metal around into a strong coil. 14. 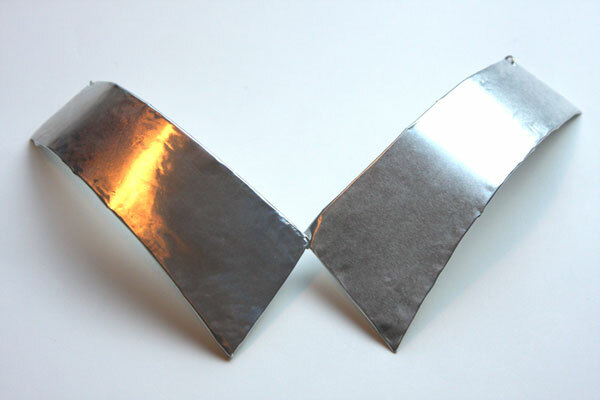 Bend that coil into a V-shape. 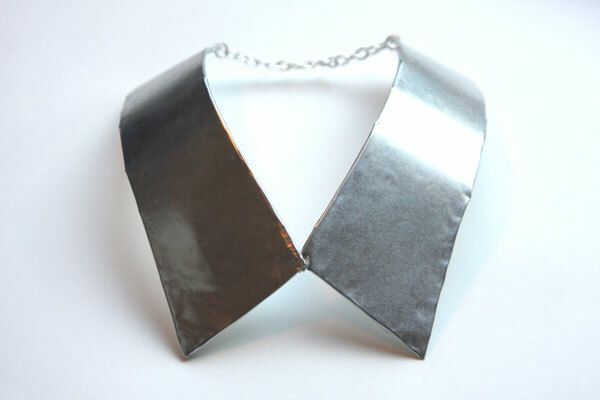 This will anchor your two collar pieces together. 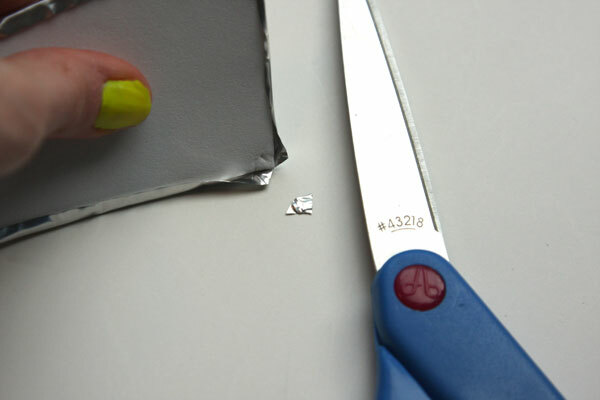 You could also potentially poke holes in them and anchor them with a jumpring, or use a piece of wire or a flattened paperclip for more strength. 15. 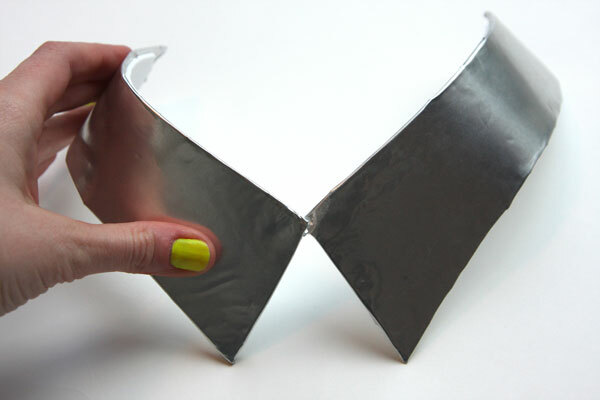 Stick a piece of stick foam onto the back of the collar, sandwiching that coiled piece of metal on the back side. 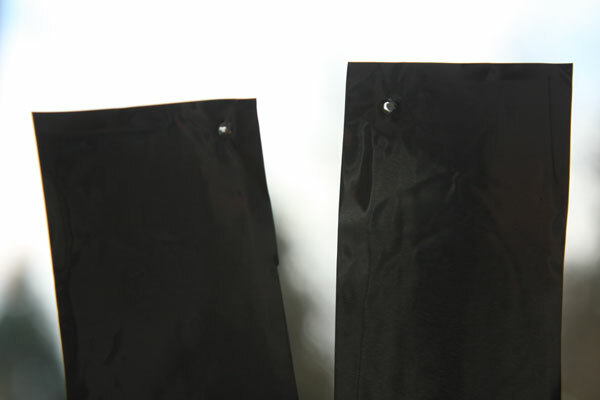 It should cover up all the sharp edges of the folded-over metal. 16. Do the same for the other piece. 17. 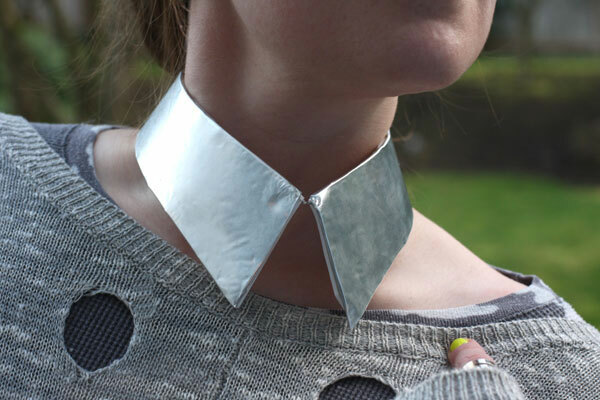 Bend the collar pieces carefully so they conform to the shape of your neck. 18. 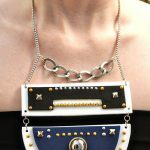 Add the jumprings and necklace chain and closure through the holes you made at the back of the pieces. 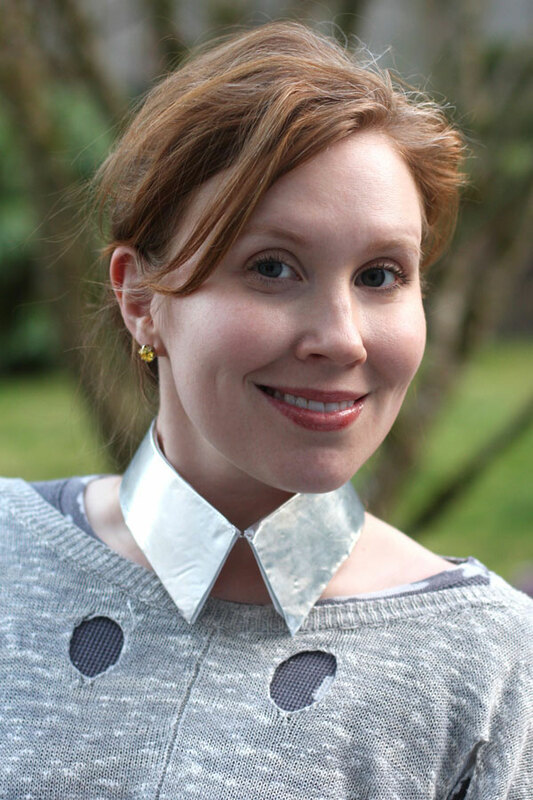 Surprisingly easy, fairly affordable, and will hold up to scrutiny – I’m loving this necklace as a topper for everything from pretty dresses to casual sweater ensembles! This is fantastic, Carly! Brilliant work. This is awesome! 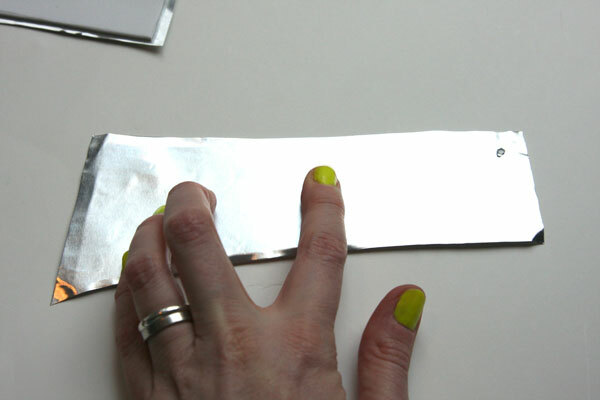 I love that its real metal as opposed to metallic paint! 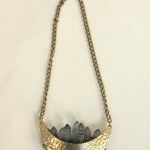 RocksPaperMetal recently posted…Rocks Paper Metal Jewelry Giveaway from Required Flare! Pink Tassel Ring! 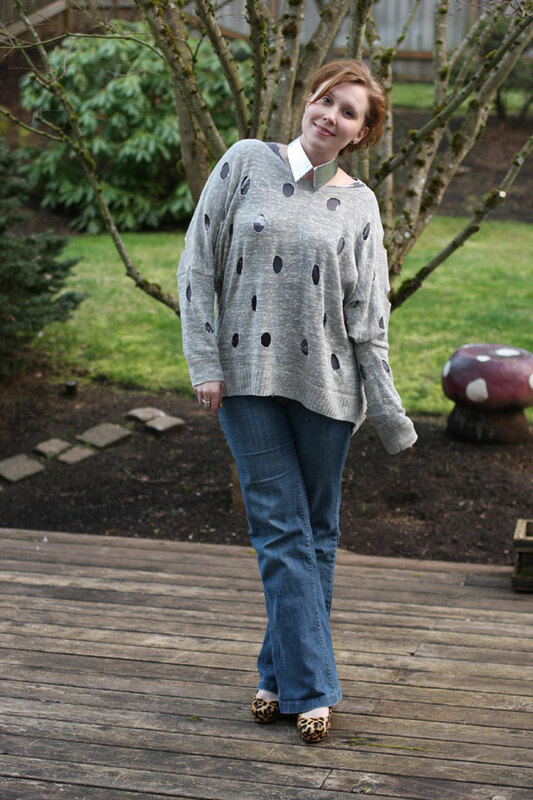 I also like your sweater!